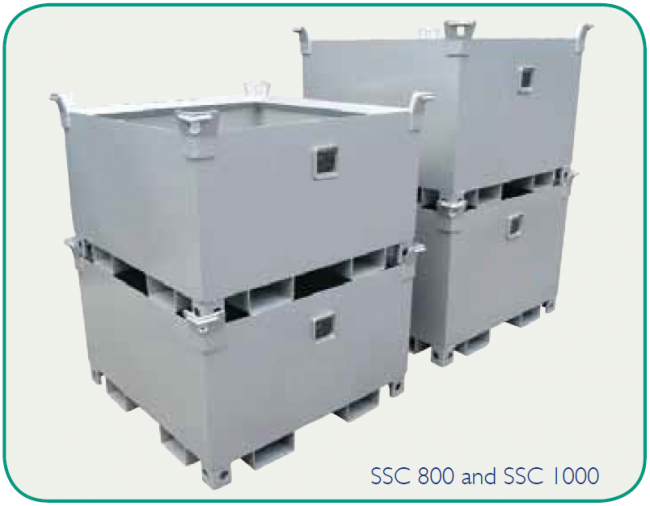 These heavy duty Stackable Crane Bins are suitable for all waste products. Built from quality 5mm plate, these fully welded unis come in either painted finish, or Zinc Plated if you think you will be regularly using wet gear. If water pooling is a problem where you need a bin, there’s no problems here. These come with corner drain holes to prevent water retention. There’s been a bit of thought put into these. The space saving shape allows bins to nest on top of each other [4high] – which means easier storage and more space for you! Once they’re on your doorstep, they can be lifted via their 4 way entry Fork Pockets or Craned via their Crane Lugs. You can even use the bottom lugs for upending the bin and emptying via Crane or Fork.